There are countless different ways to brew coffee, with each brewing method creating a different taste, texture and aroma for your coffee. If you’re just starting out at home, and it’s feeling a little overwhelming, this beginners guide from our Roastery Training Manager, Andrew Hunt, will set you on the right path. Read more to find out your preferred style of coffee, and click to read all about the equipment you need and the steps to take for a bangin’ brew in the comfort of your own home. Want your batch of brewed coffee to last the week? Then, cold brewing is the method for you! Cold brew is steeped in the fridge for about a day (between 12 – 16 hours) and once filtered can last for at least another week in the fridge. When we refer to cold brew coffee we are generally talking about the immersive method of submerging ground coffee in cold water for an extended period of time. Cold drip coffee refers to the method of dripping cold water slowly over ground coffee to filter into a separate decanter. Both can yield similar flavour results however the cold brew method generally results in a more intense, full bodied result. We’ll be focussing on the cold brew method in this brew guide. This method is simple, produces a naturally sweet taste, creates a smooth flavour, and lasts a week in the fridge. The AeroPress is one of the most convenient and versatile brewers out there. It is considered an immersion technique because we use the chamber to fully saturate the grounds and extract flavour, however upon completion of the brew we then filter through fine paper resulting in a coffee that is both super clean and full of body and mouthfeel. This method is quick & easy, doesn’t require expensive equipment and is travel friendly! 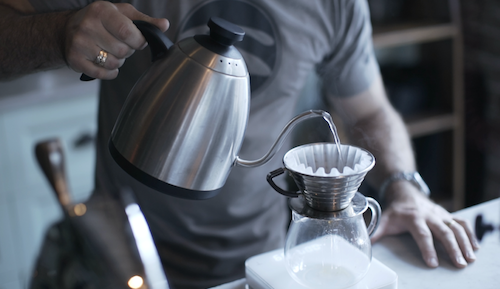 The pour over method produces clean and elegant results. We can use this method to truly bring forward the complexities and character of a coffee.